15 year old Argentinian girl rescued after being locked away for 12 years with monkey and dog. Saint Death. How did a 15 year old Argentinian girl came to be violently mistreated? A 15 year old Argentinian girl has been been rescued after being locked away for 12 years with a monkey and a dog tell authorities. The girl told cops had been beaten for eating food left for the animals, including bananas provided for the monkey. The emaciated unnamed girl who was reportedly fed the same as the animals by her captors weighed a scant 43 pounds. The girl has since been taken to a Beunos Aires hospital where she is in intensive care told Maria Gabriela Lanz who is in charge of her case. The girl’s guardians who were trying to adopt her where being held in jail. 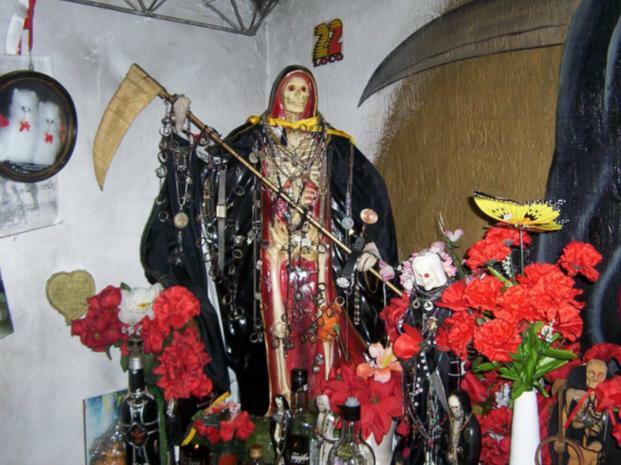 The girl’s perpetrators are devotees of Saint Death, a skeletal folk saint venerated in Paraguay, north east Argentina and southern Brazil. The devotion, attacked by some quarters of the Catholic Church, involves prayers, rituals and offerings. The judge accused the guardians of “subjugation to slavery and servitude, illegal privation of freedom and serious injuries,” since the girl was found with signs of having been beaten with a belt, treatment that investigators believe she was subjected to if she tried to “eat the leftovers” of the animals’ food. The teenager is said to have been given away by her poverty-stricken mum, who has seven other children, because she was unable to look after her properly. By 2001 the couple assigned with the girl had taken her into “provisional guardianship” after a court found that her biological parents were in no condition to care for her, since they already had seven other children and were in precarious economic circumstances. However, the two families lost contact in 2005 and apparently nobody interested themselves in checking up on the girl until one of her sisters, who recently turned 18, alerted the judicial authorities after discovering the situation in which her sibling was living. An older sister alerted police after turning 18 and finding the house where she believed her sibling was kept. The 15 year old girl told her rescuers she was only allowed out of the garage twice in the last 12 years and was beaten regularly with a belt by her captors. The guardians have been held on charges of forced slavery, severe injuries, and false imprisonment, while a plea for bail was turned down by Judge María Gabriela Lanz. Authorities told the monkey was very well fed.